Whether you’re an energy manager looking for peace of mind that you’re doing things correctly, a business owner looking to cut your costs, or a member of staff tasked with managing your business’ energy, our guide to switching business energy is ideal for you. The days of simply ringing a supplier and requesting a price are gone. Many businesses focus solely on the price of their energy and are failing to grasp the bigger picture. Look at it like this, if it’s your job role to manage the energy consumption and contracts at your firm, wouldn’t it be great to show your boss you have every angle covered? We’ve all been there when our boss has asked us a difficult question and we haven’t got the answer, don’t be that person! Our guide below provides a comprehensive overview of everything you need to know when it comes to changing, renewing or managing your energy. Price comparison websites. Most of us have used them for one thing or another, whether it’s our car insurance or home energy use. 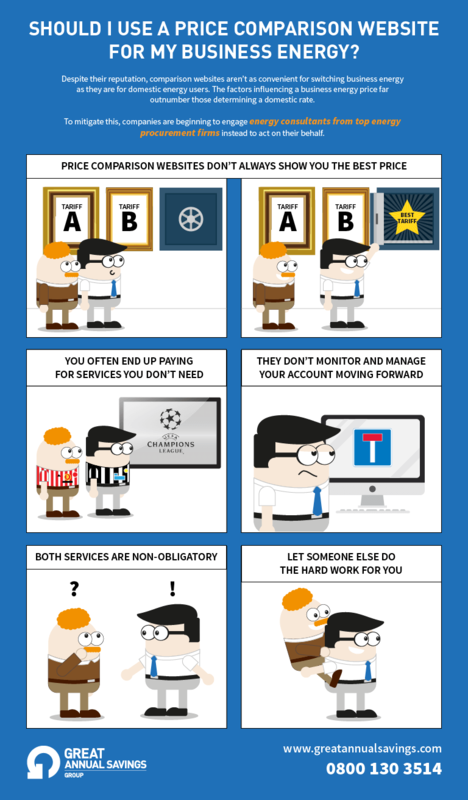 We often view them as the easiest and most cost-effective option for switching providers. This viewpoint has brought many to question whether they’re the best solution for their business. The answer is not so clear as it seems. Despite their reputation, comparison websites aren’t as convenient for switching business energy as they are for domestic energy users. The factors influencing a business energy price far outnumber those determining a domestic rate. Price comparison websites don’t always show you the best price. You often end up paying for services you don’t need. They don’t monitor and manage your account moving forward. Be smart, check rates throughout your contract and don’t leave it too late until you renew. It’s only natural that once you’ve renewed your energy, you put it to the back of your mind and focus on those tasks approaching in the more immediate future. Whilst it makes sense to do this initially, if you don’t maintain an eye on the sector over the duration of your contract, you could be in for a big surprise come renewal date. Future energy prices are volatile and likely to fluctuate over time. We need only look at the current uncertainties facing the sector with the impact/influence of Brexit and rising inflation rates. 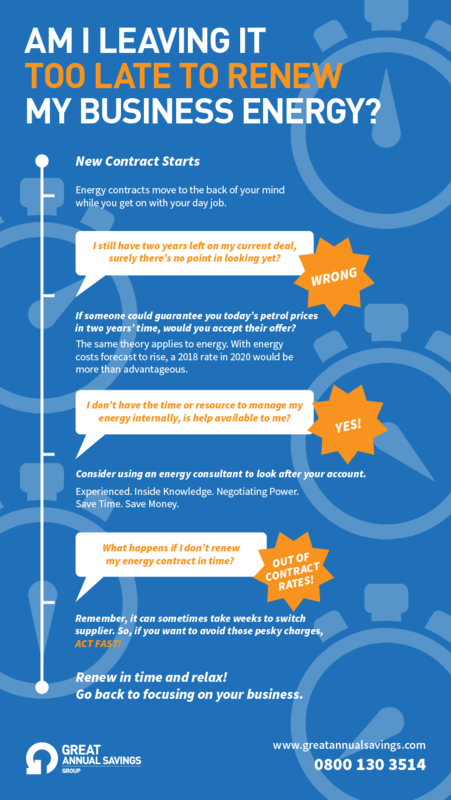 Remember, any competent energy supplier can extend your current contract on today’s rates. Regardless of all of this, there’s also the very real threat of going into out of contract rates. This is when a gas or electricity contract expires, and no suitable alternative has been found, the rates you’re paying will alter to a default charge. In most cases, this will be a lot higher than whatever you’re currently paying. When switching business energy, don’t go with the first option available to you, explore them all. 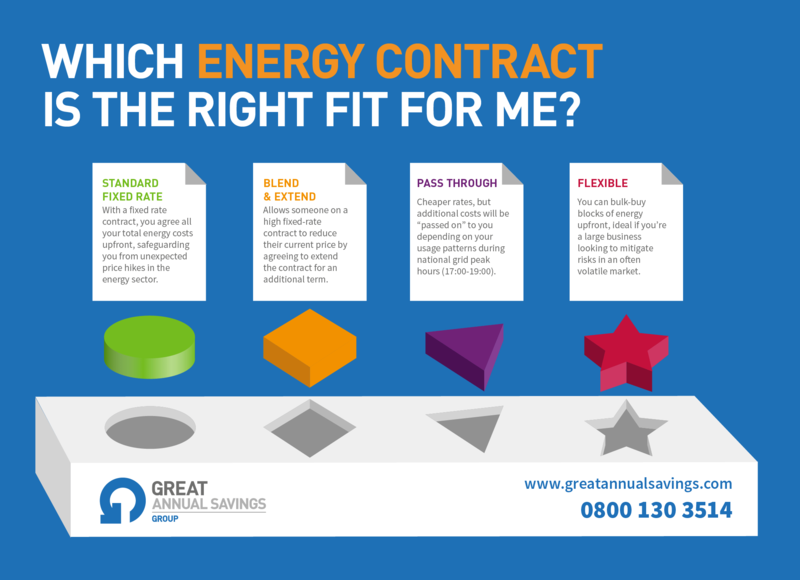 When it comes to deciding your energy contract, there is no “one size fits all”. Every business has their own needs and requirements. If you’re a local corner shop, you’re going to differ significantly to a large manufacturing firm with numerous plants. Traditionally speaking, you are normally presented with two different options when purchasing energy: Fixed or Flexible. Fixed Rate: The simplest, and for that reason, most common option for businesses. With a fixed rate contract, you agree all your total energy costs upfront, safeguarding you from unexpected price hikes in the energy sector. There are many variants available, such as a standard fixed rate or a pass through contract. Flexible: Flexible procurement is a method of purchasing your energy in large or small “blocks” prior to usage. The size of these blocks varies between businesses. This approach is ideal for large businesses with a high consumption rate. 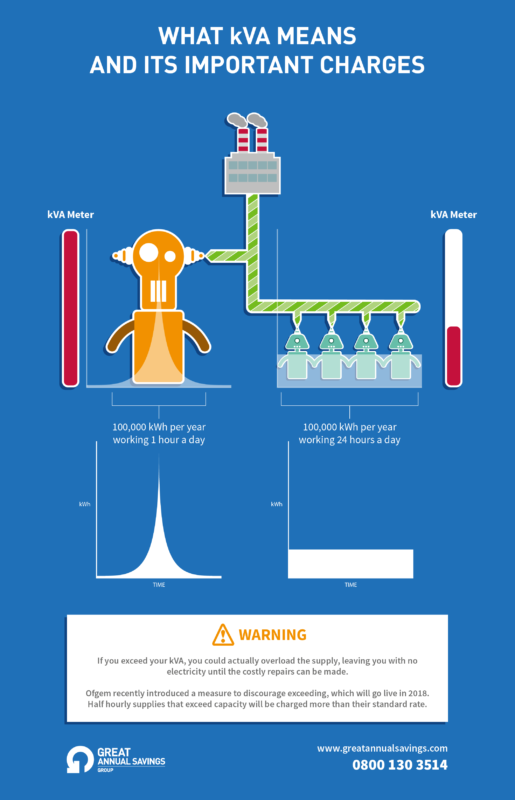 If you exceed your kVA, it can be serious. In a worst-case scenario, you could actually blow the meter and your supply, leaving you with no electricity until the costly repairs can be made. For a business, this is going to hit you hard in the pocket. But this can now cost you even more. This means you need to understand your max demand in advance of new legislations taking effect in April 2018. Make sure your meter has the right KVA – it could cost you more to have a higher kVA meter, but not as much as the penalty charges for exceeding your capacity could incur. Applying for extra electricity in your area can be a lengthy process, so the time to act is now. Make sure you manage your energy effectively moving forward. It doesn’t matter what size your business is, if you’re using more energy than you need, then you’re wasting money. As part of your energy switch, you should always carry out a full audit of your premises to identify where you are overspending on your energy. You’ll have to invest some time or money to conduct a full audit, but the results will be worth it in the long term. Monitoring and Targeting software (quite often a SMART meter) can allow a business to see in minute detail where energy is being used and where it’s being wasted. Simple management of this can be hugely beneficial and is one of the most cost-effective methods available to you. 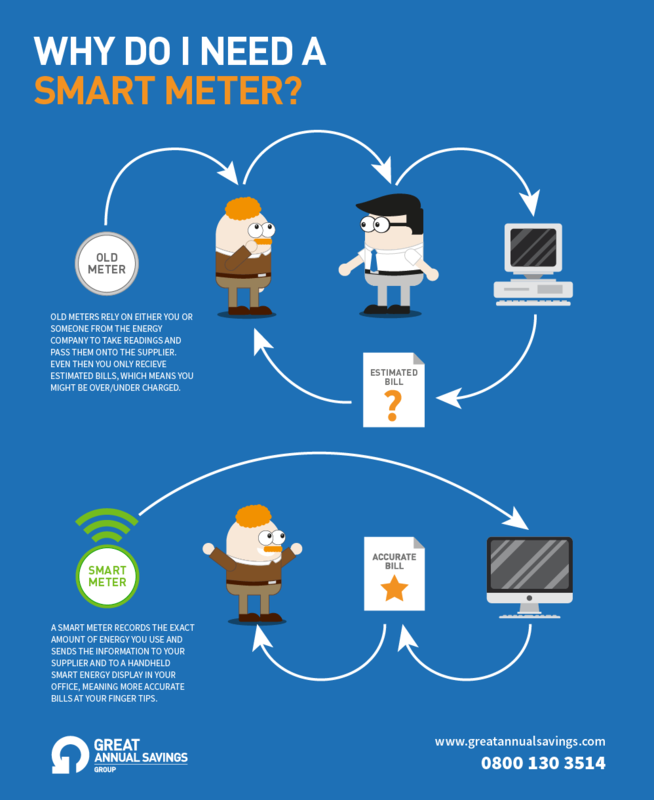 Install smart meters, trust us, you won’t regret it! But this isn’t the only reason you need one…. A smart meter measures exactly how much gas and electricity you’re using and (literally to the penny) how much it’s costing you! You won’t even need to send the meter readings to your supplier as they have access to the same data. Provides you with accurate bills- so no unpleasant surprises at the end of the month! By identifying the activities that cost you the most – you can actually do something about it! Promote “Energy Champions” within your business. So far, we’ve highlighted many ways in which you can save on your business energy. There’s no point in going through the first steps of changing if you aren’t going to manage your energy usage effectively. If you’re to do that, you must also look to change the culture of your business. Promote “energy awareness” training within your firm. You’d be surprised how much you could save annually by people doing simple things like turning the lights off when they leave the room! We’re not silly, and we understand that your staff are human beings. Realistically, not everyone will take energy saving to heart, and in truth, old habits die hard. 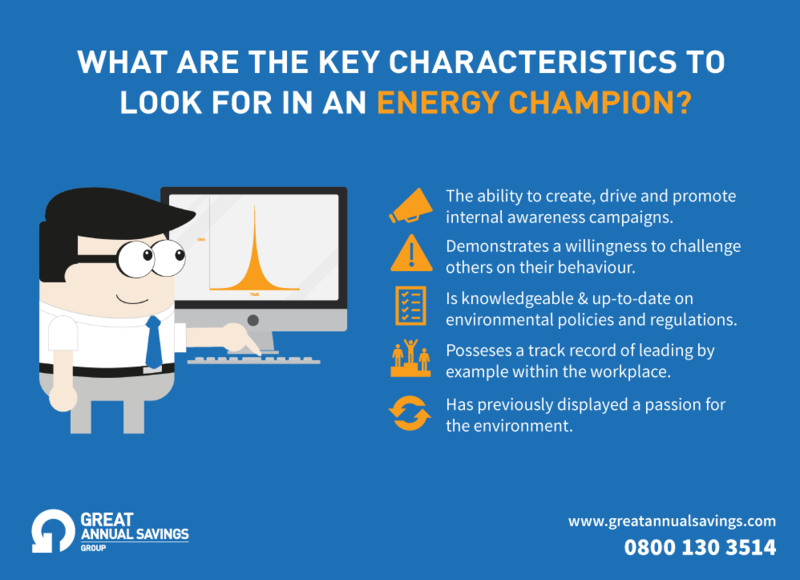 This is why appointing “Energy Champions” – someone who’s role it is to encourage energy behavioural changes in the workplace, would be the ideal first step to changing this. Everything you need to know in under two minutes! 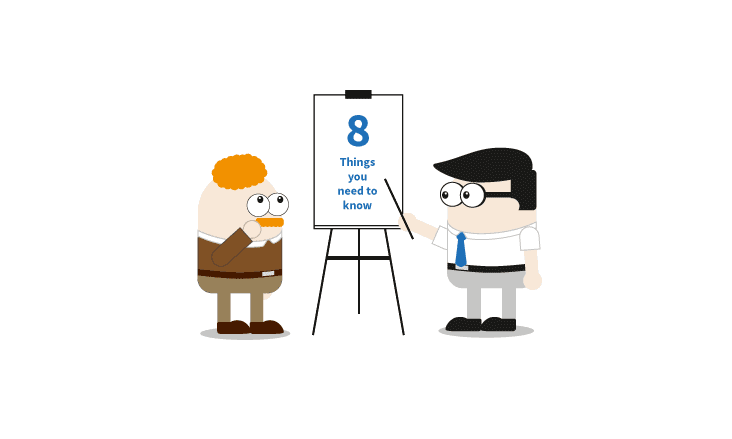 Make sure your business is fully compliant with the latest legislations. 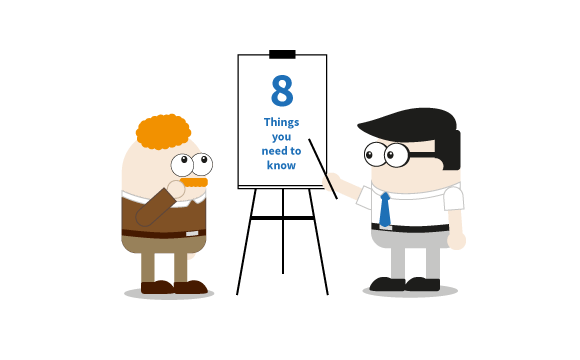 ESOS, EPBD, TM-44, EPC & DEC – Do any of these terms ring a bell? If the answer is no, it’s time to act. Failure to comply with all three can see significant charges. An energy consultant should be able to conduct a quick analysis of your business energy procedures and identify whether there are any outstanding issues that could cost you down the line. You should now have everything you need to approach your energy renewal with confidence. If there’s anything else we can help with, or any queries you have that remain unanswered, get in touch and discuss switching business energy with our team today.